The rain has certainly returned with no apologies. Whatever. Fine. We’ll adapt because that’s what we do here in Cascadia. 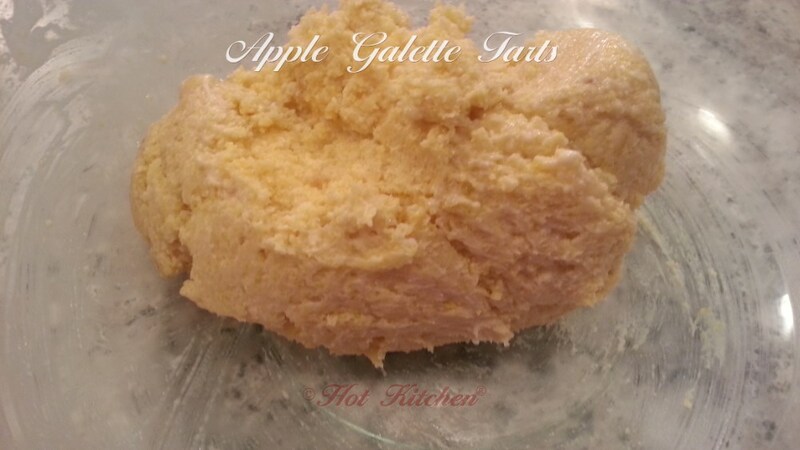 Fortunately, there are consolation prizes for all this precipitation.Time to break out the flour, butter, and sugar and bake up a storm because nothing warms the soul like baking apple what-nots. 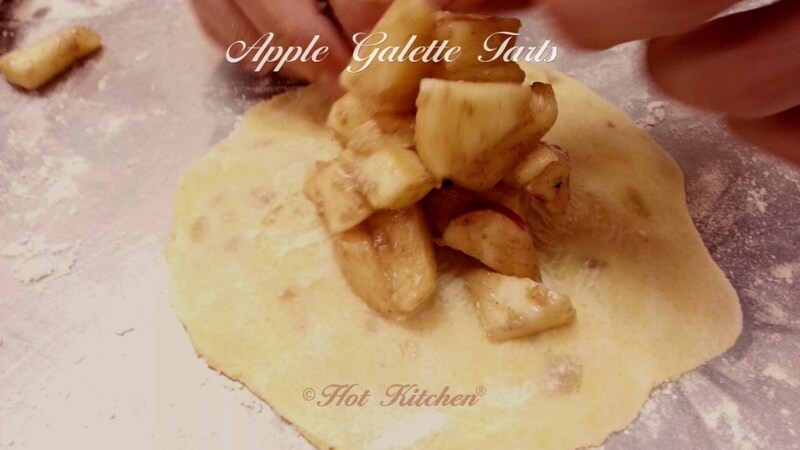 The first autumn delight for Hot Kitchen was developing a mini apple galette tarts recipe with a nice ginger-laced crust. 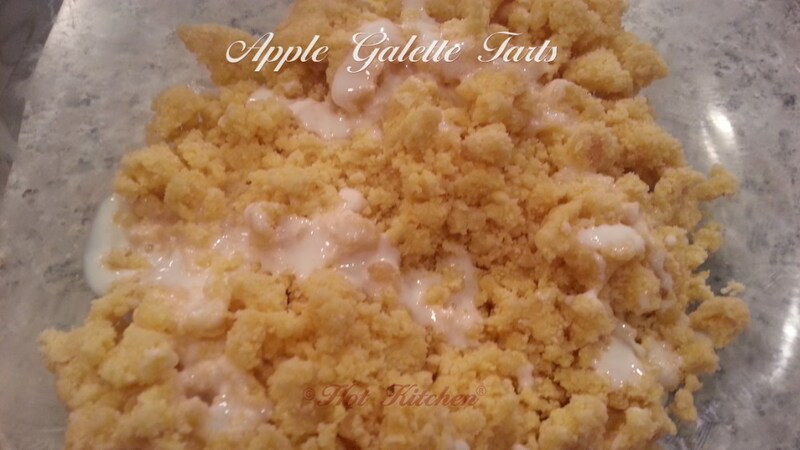 It was a recipe that needed testing in advance of a cooking class at In Good Taste — who doesn’t love testing recipes? 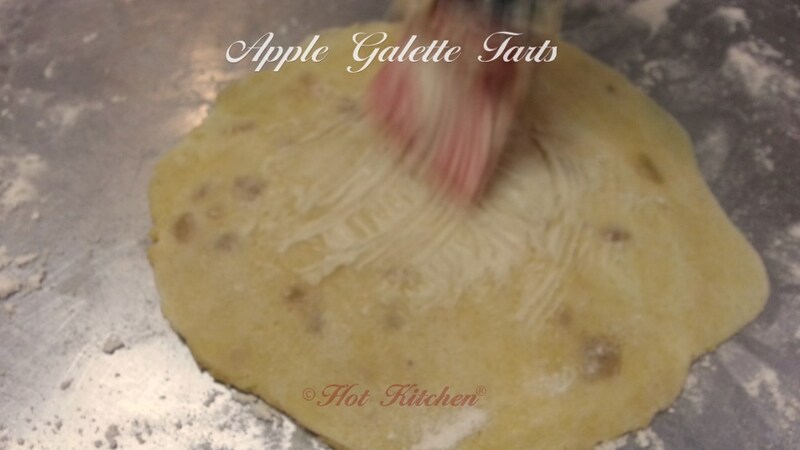 Galette recipes are wonderfully versatile and refreshingly imprecise. Try other semi-soft fruits or try substituting nuts for the ginger. Replace the sugar with something savory like herbs, minced onions or shallots , and bump up the salt by a couple of pinches, and you’ve got a savory crust ready for an onion tart or roast turkey, spinach, and cheese galettes. 1 teaspoon cinnamon a dusting of green cardamom, cloves and nutmeg approx. Pour the flour, cornmeal, sugar, and ginger into the mixing bowl. Whisk several times to combine them well. 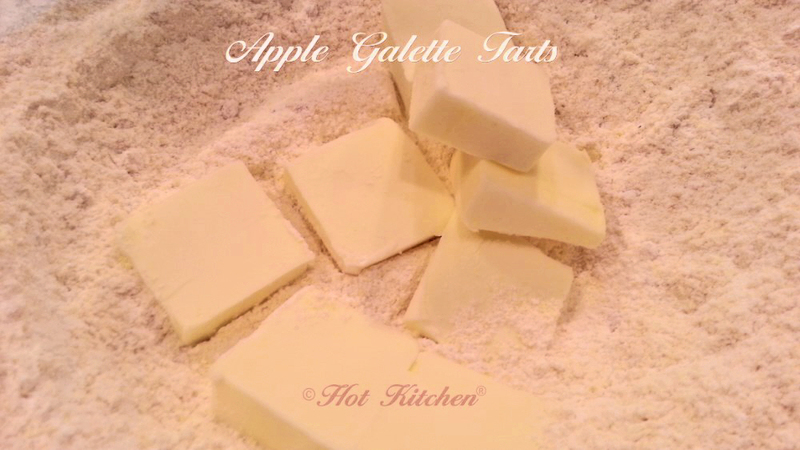 Cut the cold butter into the flour. Cut it together until you have little lumps that are pea sized and smaller. I suggest you use your fingers to squeeze, mill, and roll the flour and butter together. Combine the ice water and yogurt together. Leave a few cubes of ice in the liquid to keep it chilly. Drizzle the wet ingredients over the butter-flour blend a little bit at a time (but don’t add the ice cubes). Fold together until the dough just clings to itself. Gather the dough into a ball and then cover it with a towel or plastic wrap. Chill it in the fridge for two hours. After chilling, flatten the dough into a thick disk. Break into 8-10 equal pieces. Roll each portion into a ball. Sprinkle a little flour on the counter. Roll each ball into a disk about ¼ inch, thick (4-5 inches across). Flip the dough a few times and sprinkle more flour as needed to keep the dough from sticking. Run your spatula under the crusts to loosen them from the counter. Toss the apples in the cinnamon and balsamic vinegar, add sugar to taste and enough flour to just coat each apple bit. Brush the center of the crusts lightly with soft butter. Add a small mound of apples to the middle. Finish with another dot of butter. Flop a side of crust over the filling. Continue around the tart, pleating the crust naturally as you go. Make sure the crust is snug up against the filling. Use your spatula to put the tarts on your pan. If you’re using a stone, take care to preheat it in the oven. Bake for 20-30 minutes, or until crust is golden and filling is sizzling. From the top, clockwise: Cornmeal (actually fine organic polenta), sugar, flour, and minced ginger. Drizzle the yogurt/ice water blend over the dough a bit at a time and fold together. Add a little bit at at time – you probably will not need it all. This is how the dough should look. Slightly sticky and holds together nicely. Brush the middle of the dough with a bit of butter to help the filling set correctly. 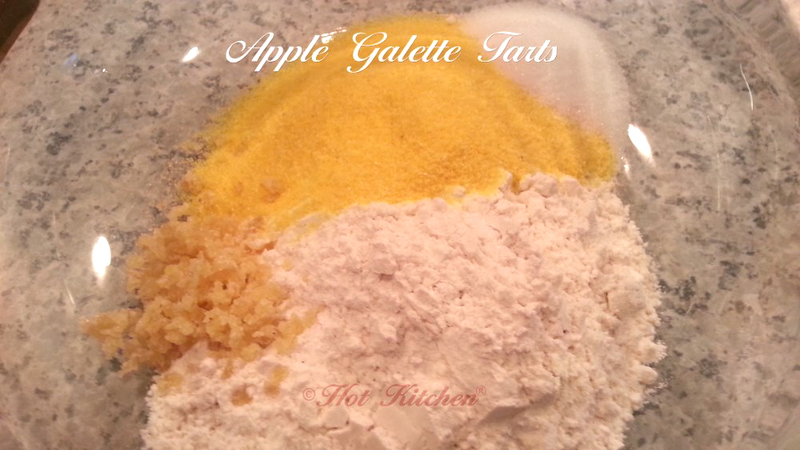 Place the spiced-sugared-floured apples in the center in a column. Leave plenty of edge to fold the dough around the filling. 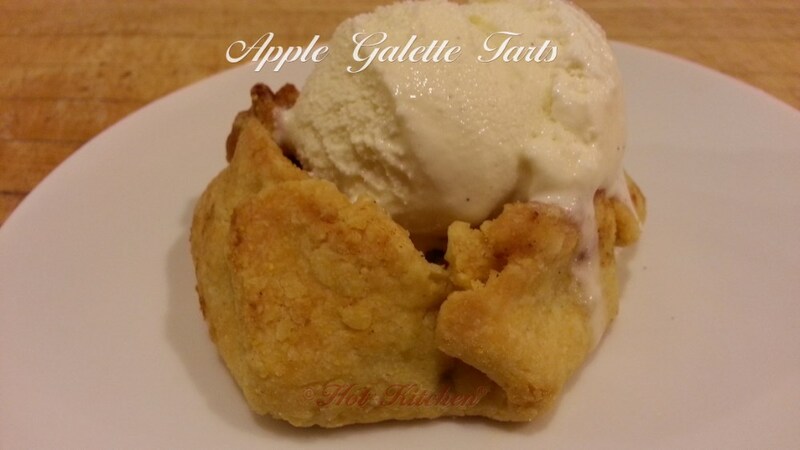 Chef’s Notes: Galettes are rustic and therefore nearly impossible to do “wrong.” These are an excellent pastry for a beginner and a less demanding endeavor for the advanced baker. About all that butter…well this is a French pastry, so we say c’est la vie. For a non-dairy option (and slightly heathier) try using coconut oil in place of the butter. Add a pinch of salt to the crust if you make this substitution. 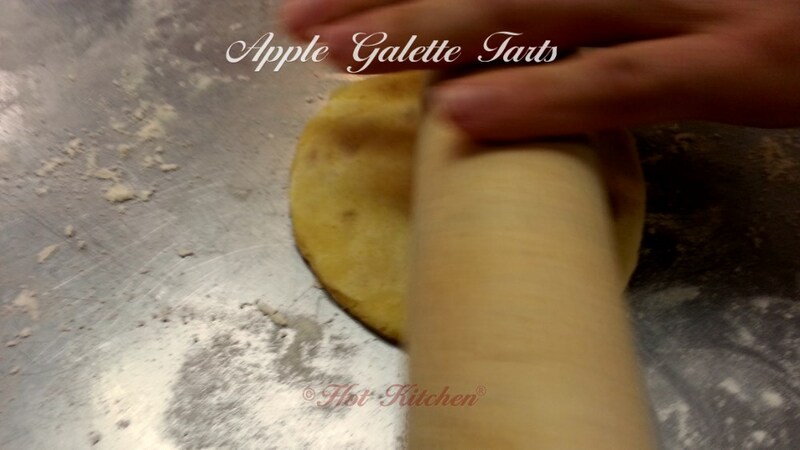 Want more galettes? Read this post!